The second reason Medium is preferred is the editor. It was a major advance in browser-based editing when it came out five years ago. If you were to graft the Medium editor onto WordPress and reorganize the commands, you’d really have something. They could address the question he raises by providing a standard “reference release” of WordPress that includes a set of commonly used plugins that are known to work well with each other. Dave is quite right about this. 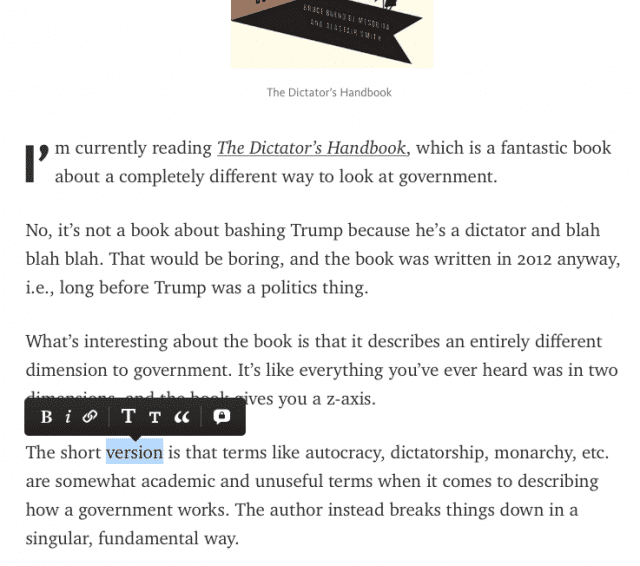 The Medium editor is fantastic, and the layout of the content it produces is super clean. But I fundamentally dislike Medium as a…well, medium platform. The reason is that it feels like a trick. It reeks of a Faustian exchange that you will inevitably lose. Valuable ideas should be owned by their creators, not distribution networks. Networks change. They die. They evolve. The get bought. They sell out. I don’t know much of anything about how Medium is managed as a company, but I do know that their interests and the interests of those who produce content for it are not cleanly aligned. Medium makes money off of other peoples’ content. They get very little from it. They get exposure to some degree, but all the traffic is coming to Medium, not to their domain. At some point these content creators are going to realize that Medium owns that content. Maybe not legally, but practically. When you see the same theme for every post that’s a brand. Who’s brand is it? Medium’s—not the creator’s. There are many good things about Medium. It gets people writing who are intimidated to do it elsewhere. It creates a clean look. And it exposes writers to a wider audience. But my intuition tells me that it’s ultimately bad for the writers over time. I firmly support the concept of everyone creating their own ideas, and then using their own platforms to broadcast those ideas. Medium just doesn’t get us there. Let’s take the good (the editor) and discard the bad (other people owning your platform). If you want to innovate in distribution, the answer is to use machine learning and high-quality curation to find the best self-published content and bring it to peoples’ attention. That would be innovation in the content space. Until then, let’s back WordPress and similar tools, and get Medium’s awesome editor features/feel incorporated as options. Just for fun, while writing this, I cross-posted a recent piece to Medium just to see what it was like. The editor was sublime, as expected.